Bambino and I have done a lot of flying together -- about every other month since he was born. Before our first international trip, I'd been thinking about making a travel organizer to keep the essentials at hand while on the plane. Before a trip to Minnesota, I made one to try it out. It was a fantastic tool! I made a second one -- slightly improved -- for my niece who traveled to the UK and Ireland a month later. My sister said she loved it, too. So, here are the instructions for you to make your own Organizer and Play Center for the Plane. This project took me about 90 minutes. A Note: Most of what I did, you could do with a glue gun. It wouldn't be as permanent, but it would work. So, those of you who don't sew, don't despair. 1. Replace the zipper pulls. The pulls on the zippers were rather chintzy and probably a choking hazard, so I replaced them with ribbon which I sewed into a loop and then tied into a knot. They are now about the right size for little fingers to grab, and I'm not worried about him chewing on them at all. Once made, I sewed these into the folds of the organizer. I hemmed the ribbons and them sewed them to the top of the organizer. 3. Sew ribbons to the top for tying. So, here's how you hang the organizer when you are on the plane -- and they also tie it closed when it is packed up in the diaper bag. Cut 2 pieces of ribbon -- 1 yard each in length. Hem each end of the ribbon to prevent fraying. Sew one to each of the top corners of the organizer. When you are on the plane, tie these ribbons to the tray table in front of you or the child -- the organizer will hang easily and can't be pulled off or dropped. Here it is held together by the elastic garter. 4. 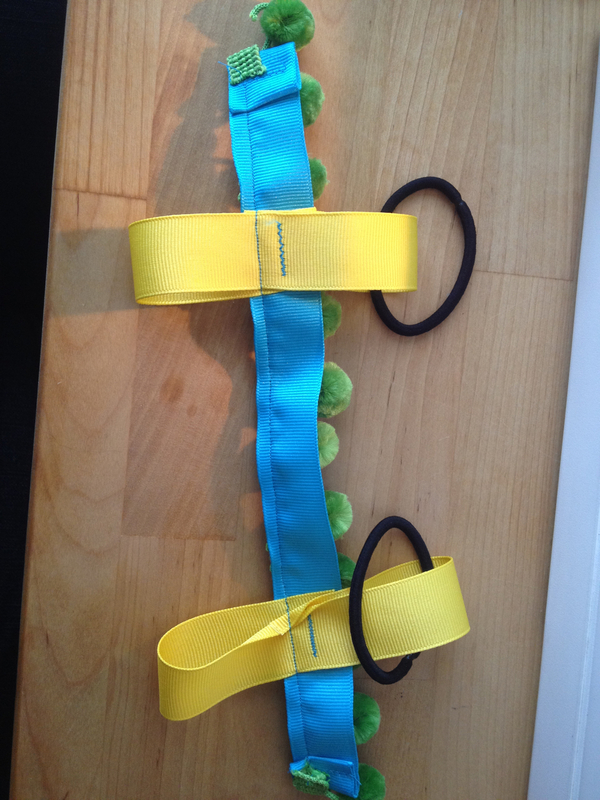 Make an elastic garter (optional). You can tie the organizer shut with the ribbons, but it also might be helpful to have an elastic belt to cinch it shut in a hurry. 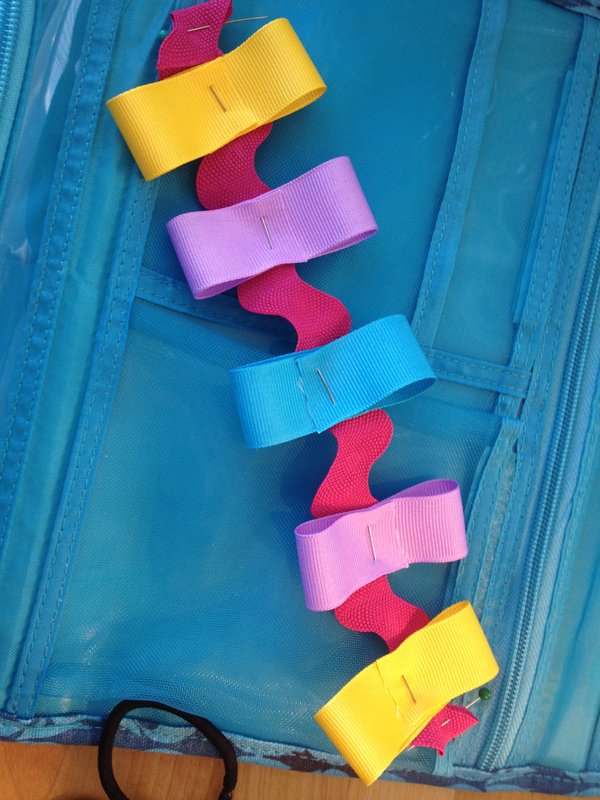 Additionally, you could hang the organizer from the elastic if your child is in a rear facing car seat on the plane. Cut a 24" piece of elastic. 5. Load it up! I filled mine with toys and books, snacks, diapers, hand sanitizer, pacifiers, and wipes -- everything that you may need to keep from having to dive back into the diaper bag over and over again. Here it is all packed and ready to go! A few notes: I needed this to be a fast project, so I cut a few corners, but the end product didn't suffer. I chose one thread color -- in my case turquoise. When the thread was going to be obvious, I used the fancy stitches (that I never use!) on my machine. And the end result is pretty cute. I hemmed the ribbon anywhere I could to keep it from fraying. That's one place where you could save some time. You could use an anti-fraying product, a glue gun, or even pinking shears instead. Enjoy! And if you make one, I'd love to see a photo!